Bella Hadid had been all up in the headlines recently after photos of ex-bae, The Weeknd, getting all kissy face with Selena Gomez surfaced. 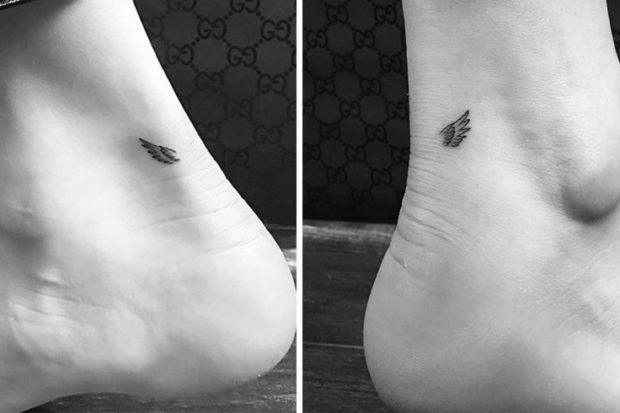 We can definitely relate to the rollercoaster of emotions she’s likely going through, but fortunately we can turn our attention away from THAT situation and focus on the fact that the supermodel just got the cuuuuutest set of teeny tiny angel wings on either ankle. The tattoos are rumored to be a potential homage of her first walk down the Victoria’s Secret Fashion Show catwalk, which BTW she totally slayed. It’s a good reminder that a broken relationship doesn’t mean life is over and there are so many amazing things she has to look forward to in what we suspect is going to be a lonnnng career in front of the camera. Plus, they are so adorable and well done, it’s easy to have major ink envy looking at them. Regardless if you have ink, what do you think of Bella’s new angel wing tatts? Hot or Not?